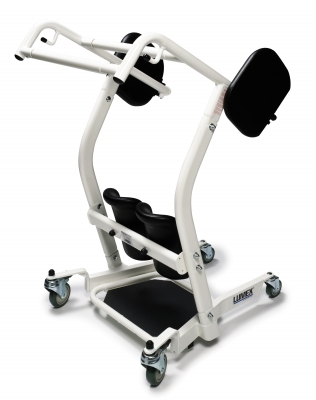 The Lumex Stand Assist is a transport assistance unit that keeps the resident actively engaged in the transport process. 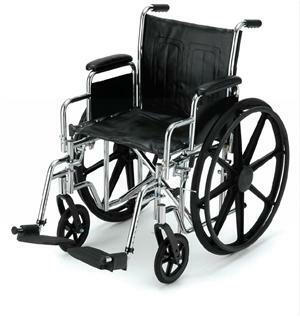 Transport functions of all kinds are quick, convenient, and require minimal caregiver assistance. Users grasp the middle bar and use their own strength to pull themselves up into position. 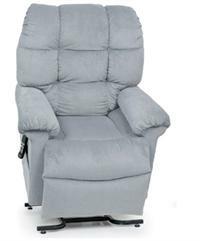 A padded split seat swings out to allow loading or unloading, then swings back to form a comfortable and stable transport seat. The Stand Assist is a convenient toileting alternative to a wheelchair. 400 lb safe working load Padded dual knee pads and seat pads for comfortable transport Stable base with locking rear casters Fits easily through narrow doorways Affordable alternative to electric sit-to-stand lifts Note: The Lumex Stand Assist is designed for residents who have the strength and stability to lift and support themselves. 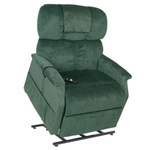 We recommend an electric sit-to-stand lift for residents with limited strength and stability.